After several prototypes, I finally managed to churn out a Mesh hair that I hope challenges the quality of many current, rigged Mesh hairs. 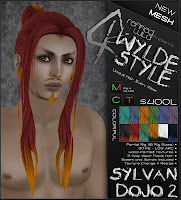 In developing new Mesh hair for Second Life, I've done my best to make the hair as versatile as possible. I've done several things in developing the hair that may actually make Mesh hair an easier experience in terms of fitting their avatar. The hair is partial-rig, instead of full rig. 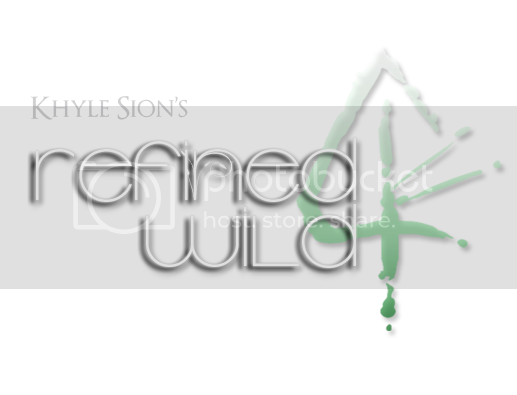 I've made it so that it deforms quite well when you adjust your shape with the appropriate sliders. It includes a whopping 18 different rig styles for better avatar fit and customization (as it won't deform to things like facial width, forehead slope, and the like). 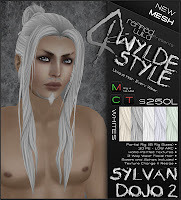 Giving customers freedom to modify their purchases, while moving forward in terms of quality, low-lag/low ARC hair, has always been of the utmost importance to me - especially in light of the fact that you can't directly modify rigged meshes. Lightening the load time and resource consumption of often prim-heavy hair has also been a main concern of mine. 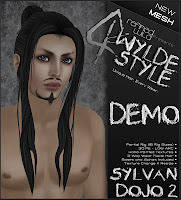 Counting in at about 30 PE at rezzed size, Sylvan Dojo 2 is probably one of the lowest-resource-heavy mesh hairs out there right now. 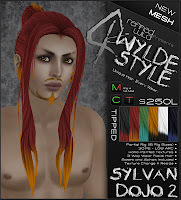 This is NOT a mesh hair made out of sculptie shapes, and imported as mesh (like many other mesh hairs currently available). 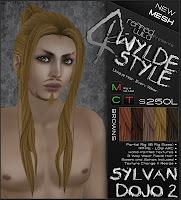 This mesh hair is professionally modeled from scratch, textured by hand, and rigged to the extent that SL's skeleton will allow, in all its imperfections. You really can't expect anything less! 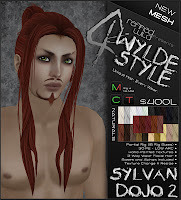 In ye olde Wylde Style tradition, Sylvan Dojo 2 comes with 3-way wear facial hair (which makes the very fetching mustache/goatee combo you see above when all put together) and a Hat/Hood friendly version of the mesh base. 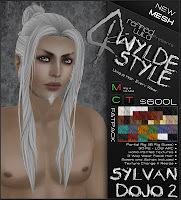 An Alpha layer specifically created for the hair to hide the scalp is also included, as are matching Hair Bases for all the colors in whatever package you choose to buy. My Mesh hairs are now also implemented with low-lag, deletable resize/texture change scripts, to offset some of the weight that the overabundance of Rigs will put on your inventory. 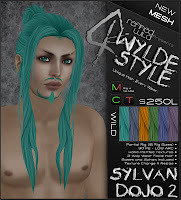 Simply wear your hair, click on it, and you can resize or change the color on the fly - just remember to make a copy before you play with it! Many more colors are now available, each in their own separate pack at $250L apiece. You can also purchase a pack of Natural or Colorful shades for $400, and a whole Fatpack for only $600L. 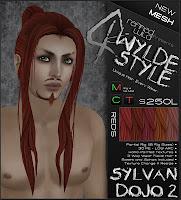 The textures are hand-painted to give the hair a nice, soft realism - colors are picked with just as much care. Be sure to try on the DEMO before you buy. 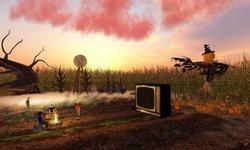 They are available for free in both my In-world store and on my SL Marketplace. 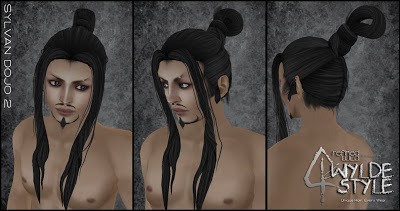 The available Rigs will look different on all avatars, so it's always best to make sure they work with your 'look'. If you like the EYES that they're wearing, be sure to check out my hand-painted Bright Eyes. You can buy them for $150 a pop In-world. Each color comes in 3 iris sizes, and they include prim eyes for glow usage, odd-colored eyes and so on. As always, click the ad to get to the corresponding Marketplace page. Enjoy!